Blueberry Velvet Cake | FoodGaZm.. This cake has a rich and indulgent flavour that is to be enjoyed on special occasions only! For this cake I have not used a heavy dose of food colouring (though please do if you want a luridly gorgeous purple cake) I have just used puréed blueberries with an additional 3 tablespoons of blueberry syrup and a tablespoon of purple organic food dye. Don't be scared though, it is fabulous when it is bright purple too! Purple food colouring – colour to the colour you prefer, a tablespoon or so of natural colouring gives a deep indigo purple, by all means though go nuts. Cream the butter and sugar with the vanilla until very pale white and very fluffy. In a separate bowl or food processor/mixer add the salt and the additional 2 tablespoons of sugar to the eggs and whip until they are thick, pale and fluffy. Add the eggs to the butter and sugar mix, then add the cocoa. To make the blueberry purée take 1 ½ cups of whole, ripe blueberry (frozen is fine) and blitz with a blender until they are totally smooth. Pass the purée through a fine sieve, ensuring there are no seeds in the purée. Once smooth, add the buttermilk to the blueberries and mix well. Add the purée to the cake mix with the additional syrup, then fold in the flour. Once the flour is combined, add the food colouring ensuring it is mixed through evenly. Lastly, in a small bowl add the baking powder to the vinegar and mix before adding to the cake mix and stirring well. Allow the batter to stand for about 10 minutes, then divide evenly between two lined and greased 20cm high sided cake tins. Bake for around 40 minutes, or until a skewer can be removed cleanly. Place the cakes on a wire rack to cool completely before attempting to decorate – in fact this cake keeps incredibly well as it is so moist, so it can be refrigerated overnight in a sealed container before decorating the next day. Trim down each cake to remove any uneven surfaces, then cut each cake in two. Fill with two layers of whipped cream and one central layer of White Chocolate Cheesecake Icing. There is some debate about the "correct" icing for a Red Velvet cake, but here I have been a bit less traditional. In my view, make whichever icing is going to make you smile the most and please as many of your family as possible. 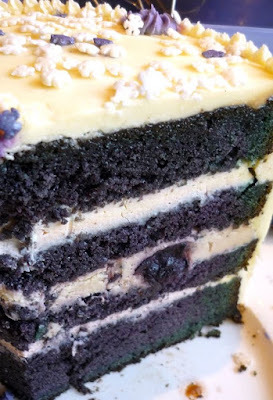 For the record, the cake pictured is iced with old fashioned butter icing with a layer of White Chocolate Cheesecake Icing in the central layer of the cake with additional blueberry syrup and a few whole blueberries added to the icing. Butter icing is pretty much what it sounds like - equal parts butter and icing sugar with a scraped vanilla bean for flavour, whipped until very pale, light and just the right spreading and piping consistency. Any other flavour can be added too, citrus, cinnamon etc. Basic proportions are about 150grams butter to 2 or 3 cups icing sugar a tablespoon of milk, liqueur, citrus juice or warm water to assist in bringing it to the right consistency. In a heat proof bowl, warm the butter and white chocolate to melting point. In a separate bowl or in a food processor/mixer, add the cream cheese, sugar, vanilla and liqueur and begin beating. Once the butter and white chocolate has melted, pour over the cream cheese mix and whip on high speed until entirely lump free. If desired, this icing can be tinted any colour you like, I used Royal Mauve for the rosettes! Once completely smooth, chill to firm up the mix before spreading on your cake with a palette knife. For smooth results do a 'crumb coat' or rough under coat then chill the cake, before adding a second layer of icing as the top coat for decorating.